It’s almost Christmas, and the family is coming over. 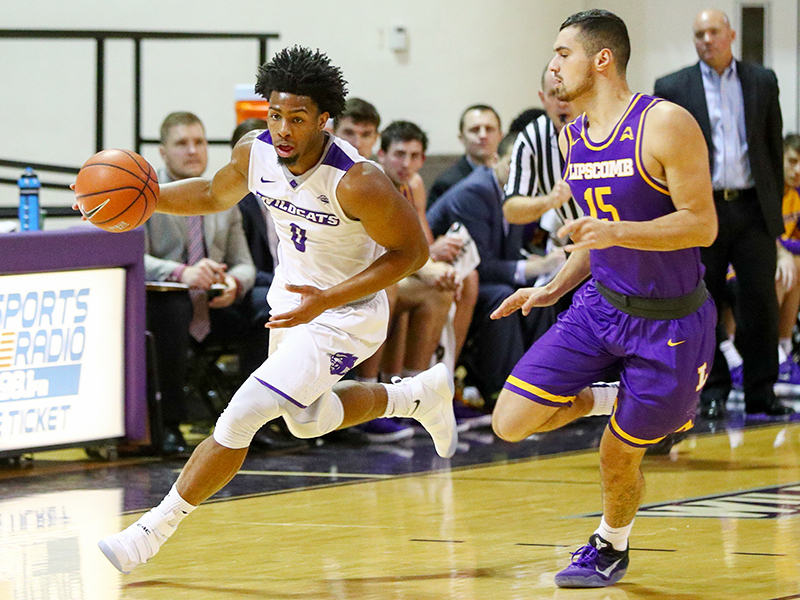 Sunday, the Abilene Christian University men’s basketball team plays Lipscomb University for the second time this season but for the first time in Nashville since 1958. It’s part game, part reunion between relatives so long-lost that many of them have no idea they are kin. But the two are inexorably linked, sharing a spiritual heritage and almost countless connections from their foundations forward. 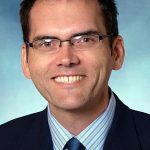 Begin with the fact that both institutions are affiliated with Churches of Christ, a group borne from the American Restoration Movement of the 19th century and spearheaded by Thomas Campbell and his son, Alexander. In fact, the name “Churches of Christ” was first used to refer to this specific group of congregations in 1906 – the year ACU was founded – and it was coined by David Lipscomb, co-founder 15 years earlier of the university of that bears his name. From the beginning, the two institutions have shared principal characters. ACU’s founder, A.B. 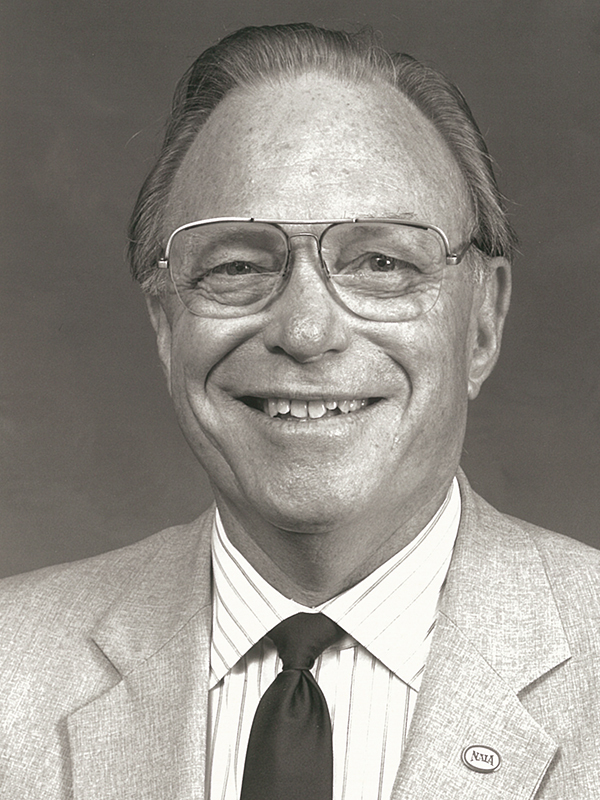 Barret, attended Lipscomb, as did the university’s fifth president, Jesse P. Sewell. Batsell Baxter was president of ACU from 1924-32 and of Lipscomb twice: from 1932-34 and 1943-46. For nearly 100 years at least – from my great grandfather, Charles R. Brewer; to the recently retired and beloved Bible professor Dr. John Willis (’55); to ACU’s current chair of the department of psychology, Dr. Richard Beck (’89) – numerous women and men have taught at both universities. And a century after the Campbells were packing pews, another father-son duo was helping fill the bleachers for each university’s basketball program. A.B. Morris became ACU’s head coach in football and basketball in 1924 and remained in the latter position through 1955. That same year, his son, Charles, who had played for him at ACU and graduated in 1949, began an 11-year run as head coach of the Bisons. Charles’ 128 victories are the third most in Lipscomb’s history and earned him induction into LU’s Athletics Hall of Fame in 1991. It was during A.B.’s last years and Charles’ first that the two teams met for seven straight seasons. In February 1955, A.B. took his team east for a four-game road swing through Tennessee and Arkansas in the “Grey Goose,” the 14-passenger Mercury that all the Wildcat teams used in those days. 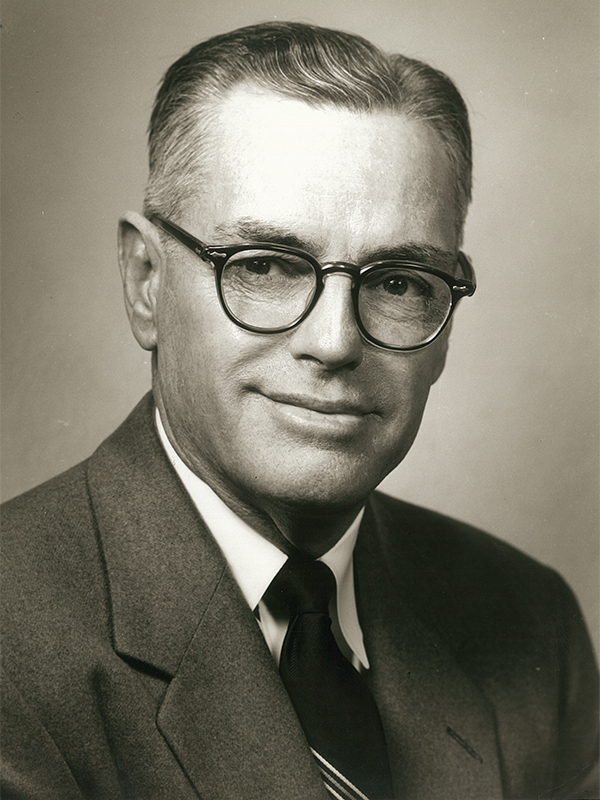 One of his troops on that trip was Tommy Morris (’55), whose father, Dr. Don H. Morris (’24), was ACU president from 1940-69 and A.B.’s first cousin. It was the next year when his actual second cousin took over at Lipscomb. And when Charles Morris brought his first Bisons team to Abilene in December 1955, the game was played at the same Bennett Gym where he and ACU’s first year head coach, Dee Nutt (’50), had starred together to help the Wildcats win back-to-back Texas Conference championships. 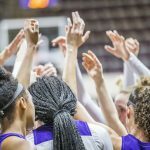 The former teammates would square off each of the next four years with ACU and Nutt coming out on the winning end in three of those meetings, including that last matchup in Nashville at Lipscomb’s McQuiddy Gym in 1958. 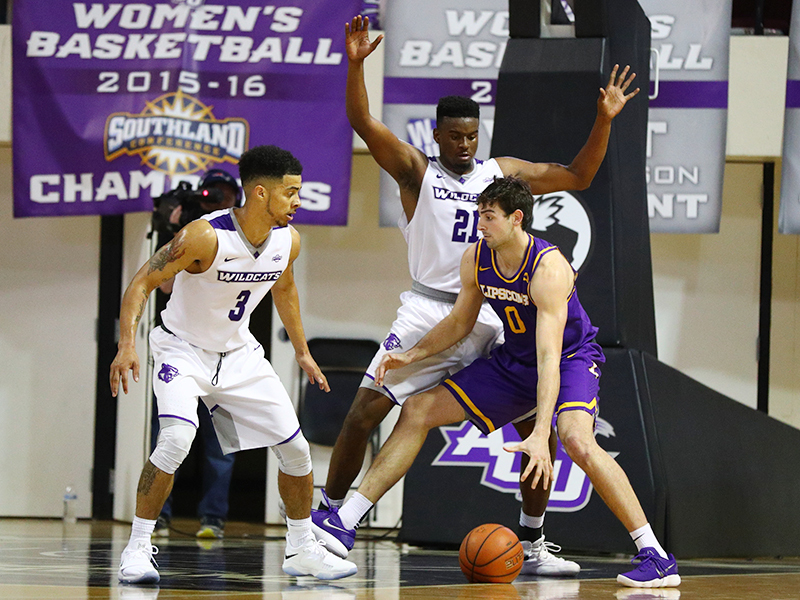 Until last month at Moody, the two teams hadn’t played at all since December 1959 in Abilene. The teams and the times bear little resemblance to those days 60 years ago. And the players and coaches competing Sunday know each other not as relatives but respected adversaries. 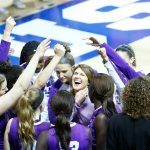 Lipscomb is coming off a 20-win season last year and is one of the favorites to win the Atlantic Sun Conference. Since losing 75-67 to the Bisons on Nov. 20, ACU has won five of six games and is now 7-3 for the season. McQuiddy and Bennett have given way to Allen Arena and Moody Coliseum. And the Grey Goose flew south for good a long time ago. But this game in this place serves as a reminder of our common roots, as institutions that emerged from a movement that sought to define believers not by denominational creed but by the simple notion that we are Christians only. A.B. 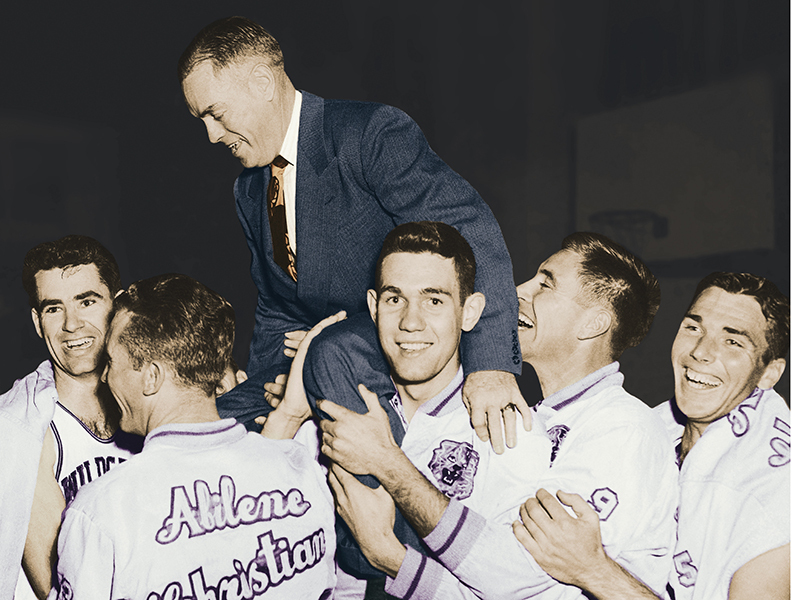 Morris is carried off the court in 1950 after his Wildcat team won its third straight Texas Conference title and 28th consecutive league game. Helping hoist their coach are (from left) Dee Nutt (’50), Omar Reeves (’50), Harold Thomas (’50), L.G. Wilson (’50) and Bill Teel (’50). This is especially meaningful for me, the son of a Lipscomb family on both sides going back literally to the first year of what was then called Nashville Bible School. Who grew up at McQuiddy feeling the rafters rattle when the Bisons tangled with Belmont University in the Battle of the Boulevard. Who went to legendary coach Don Meyer’s basketball camps and prayed he wouldn’t single me out with one of his signature scowls. Whose dad, Nick, graduated during that seven-year stretch when ACU and Lipscomb played and whose folks still live around the corner from campus. For most, this is another game. For me, it’s homecoming. And for at least one more night, those cousins, once removed, are reunited. Blest be the ties that bind. 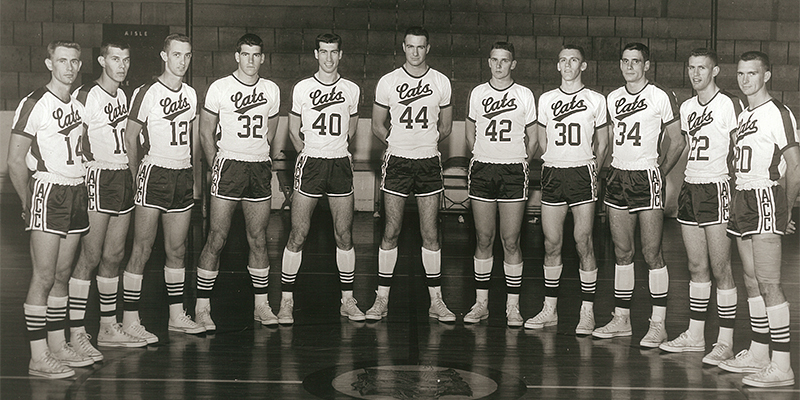 Until this year, the 1959-60 ACU men’s team was the last Wildcat basketball squad to play Lipscomb. The two teams squared off Dec. 15, 1959, in Bennett Gym, with ACU winning 84-74. From left: Ken Farris, Buddy Tarver, Mike Allen, Robert McLeod, R.A. Wade, Don Edwards, Joe Porter, Gene Denman, Don Bell, Wayne Shamblin and Ed Gattis. Grant, Your parents and I are friends at Granny White. Ed and I are in classes with them and attend many events together. Recently doing a walking tour with Jill Parker visiting the homes of many long gone Christian families. Your parents get up early on Mondays to help bring a ray of Sunshine to members with food. They are inspiring and a joy 2 have for friends. They gave Ed a special card 4 his Birthday. Wishing you the best and a wonderful New Year.